In my opinion today is just about the perfect temperature outside. It is windy, and colored leaves are flying everywhere, but people are still mowing their lawns, and while it has just enough chill in the air for a long sleeve hoodie, I can still go out in shorts. The temperatures are forecasted to be in the mid to upper 60s all week, when just a week or so it was almost 80, and now we are looking at overnight cold snaps that will most likely kill my poor tomato plants that have so valiantly struggled to stay alive through the summer. Between poor potting decisions, lack of rain, excess watering at times, and my 3 and 4 year old thinking that they would still turn if they picked them off and put them in a separate pot when they were green, they have fought the good fight. After watching the agonizing struggle they’ve had I think my dreams of tomato jam are slowly dwindling for this year. While my tomatoes may be going by the way side, there is never a shortage of mushrooms. Although I am absolutely shocked at times by how expensive they are, they are always easy to come by. Two weeks ago I bought a big container for baby bellas. They were on sale, absolutely gorgeous, and they stay fresh a lot longer than the white buttons that I would normally buy. 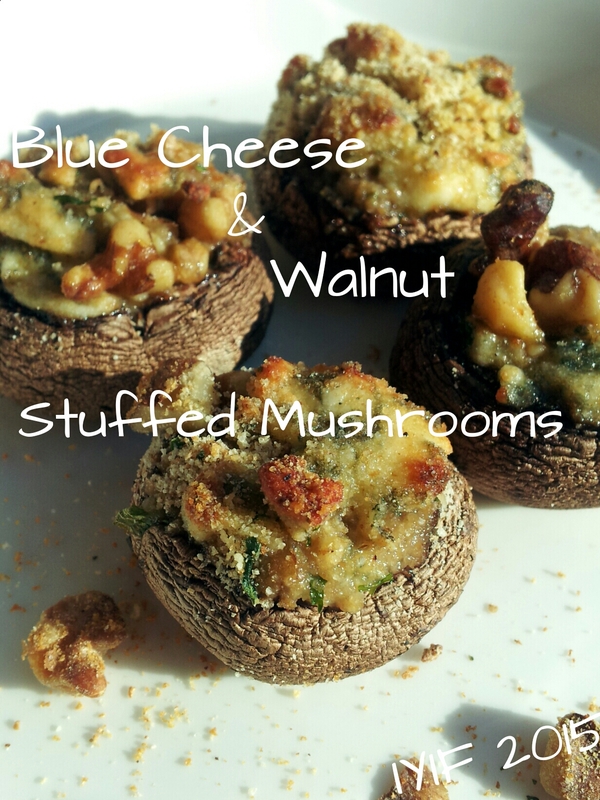 I used them in my Creamy Chicken Pot Pie, Perfect Mushroom Lasagna, Mini Deep Dish Pizzas, Mini Egg White Omelets, and Blue Cheese & Walnut Stuffed Mushrooms. 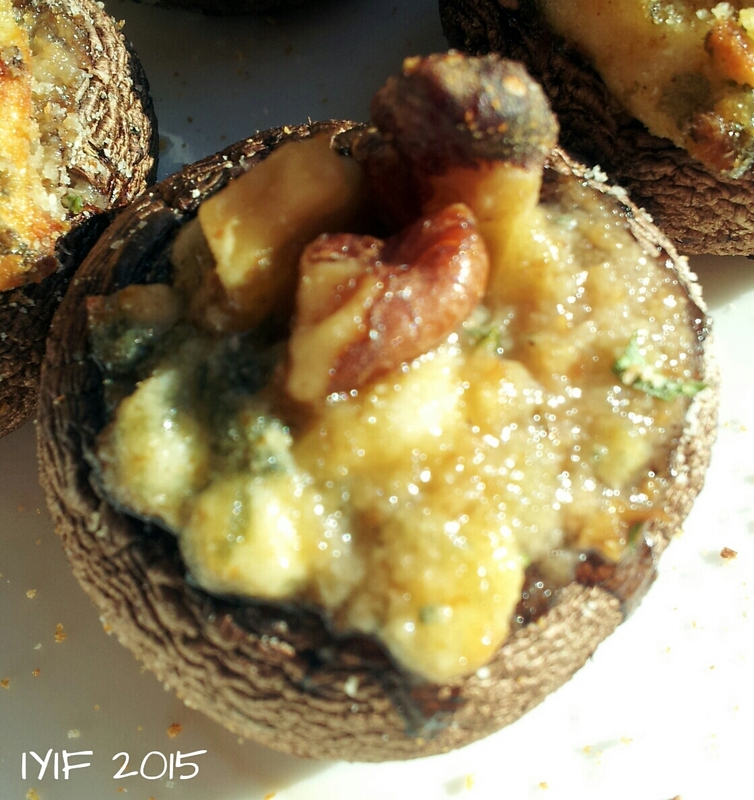 I know that you can find stuffed mushroom recipes everywhere, and they are all just a little bit different. As a matter of fact I raved over a fellow blogger’s stuffed mushroom recipe, but for the life of me I can’t remember what was in them, and I can’t find her post now. So, I would like to apologize ahead of time if my recipe resembles her’s at all. There isn’t anything difficult about this recipe, nothing extravagant, nothing time consuming. If you want a quick appetizer for a dinner party, or possibly a football party, these are super easy. I found that the baby bellas work better than the white buttons as far as holding up while cooking, and they have a richer taste. When purchasing blue cheese I just bought a little aged wedge of blue cheese from the deli that was absolutely super creamy compared to the blue cheese crumbles in the container. The walnuts achieved a very buttery flavor and the bread crumbs gave a nice texture and held together all of the ingredients without overwhelming the dish. 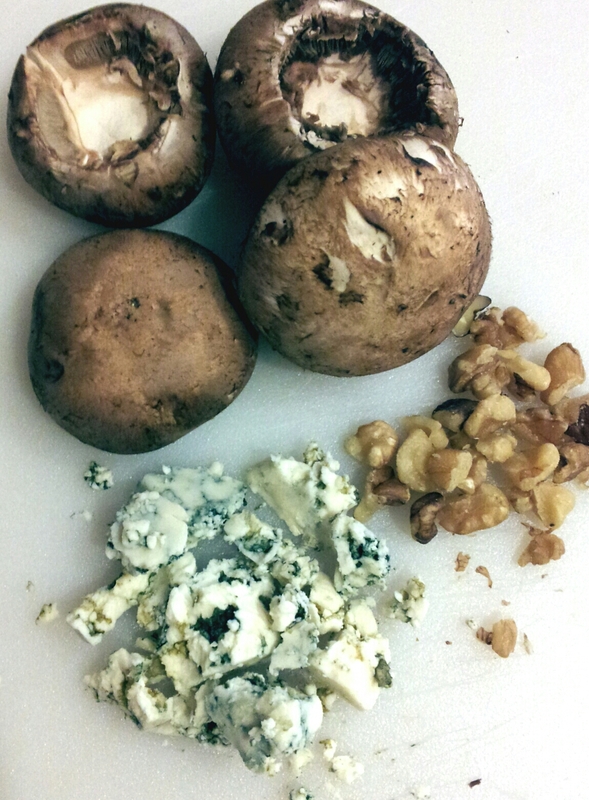 I must warn you, you have to be an absolute blue cheese lover to like this recipe. If you aren’t there isn’t any reason why you can’t replace any other soft cheese such as feta, goats’ cheese, or another type of crumbly cheese. The flavor with the blue is very deep, and very rich! If you are in a hurry you could fill these little guys several hours before you need them, and then just pop them in the oven about 30 minutes before you are ready to serve them. Once you put them on a serving tray, sit back, relax, and enjoy!